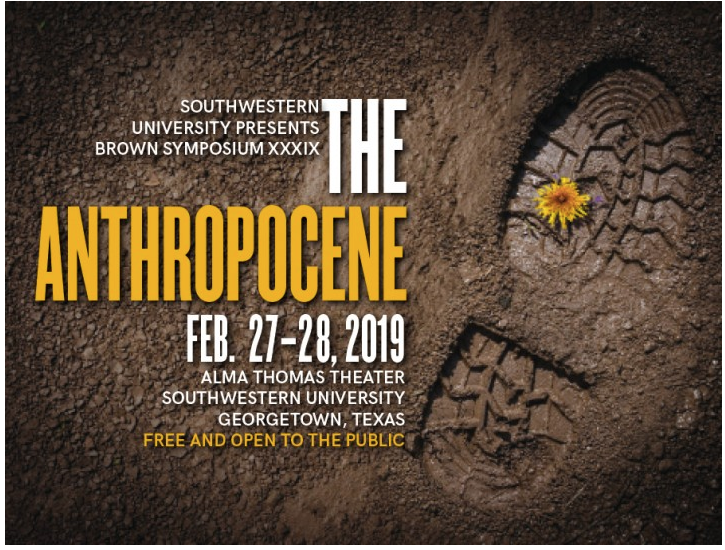 The Brown Symposium is held at Southwestern University in Georgetown, Texas. During the Symposiusm, there will be wonderful talks by several of us including Andrew Revkin, Robert Bullard, Chris Carter and myself. Join us for a thoughtful two days on the Anthropocene. My talk will be on "The Burger in the Anthropocene"
The burger, long the All-American meal, is undergoing an identity crisis. From its shifting place in popular culture to the efforts, by investors such as Bill Gates, to seek to find the non-animal burger that can feed the world, the burger’s identity has become as malleable as that patty of protein, itself, before it is thrown on a grill. Carol J. Adams will explore the history, business, cultural dynamics and gender politics of the ordinary hamburger. After defining the burger as a modernist solution to protein delivery whose time has passed–and explaining why that is–Adams delves into the history of the veggie burger and the emergence of plant-based meats, including burgers. 1) A feminist case for animal ethics (feminist ethics of care/relational ethics/exploration of overlapping and interconnected oppressions). 3) How feminist perspectives help to illustrate why sexual harassment was a pernicious problem in animal advocacy (including how white vegan men dealt with the association of meat and masculinity, the development of “bro culture” in the animal rights movement, and the challenge of accountability). It will be at WCC 1010 of Wasserstein. The main law school building. Join Virginia Messina and myself at the Berkeley Books Inc bookstore for a reading from and book signing for our new book, Protest Kitchen. I'll be joining all the good folks at the London VegFest for their annual everything vegan conference. 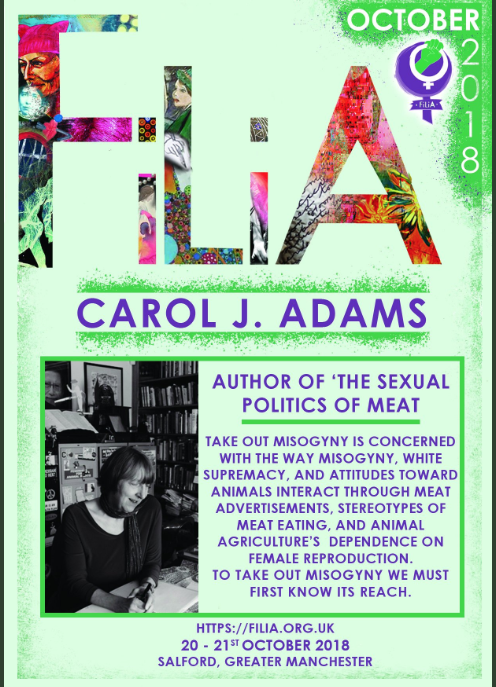 I'll be speaking at Oxford University, updating the ideas of the sexual politics of meat and applying them to this current political moment, including discussions of the ongoing association of meat and masculinity, the use of misogyny in animal agriculture, and how literary criticism provided a way to conceptualize interlocking oppressions. For more information check out the events page on Facebook. 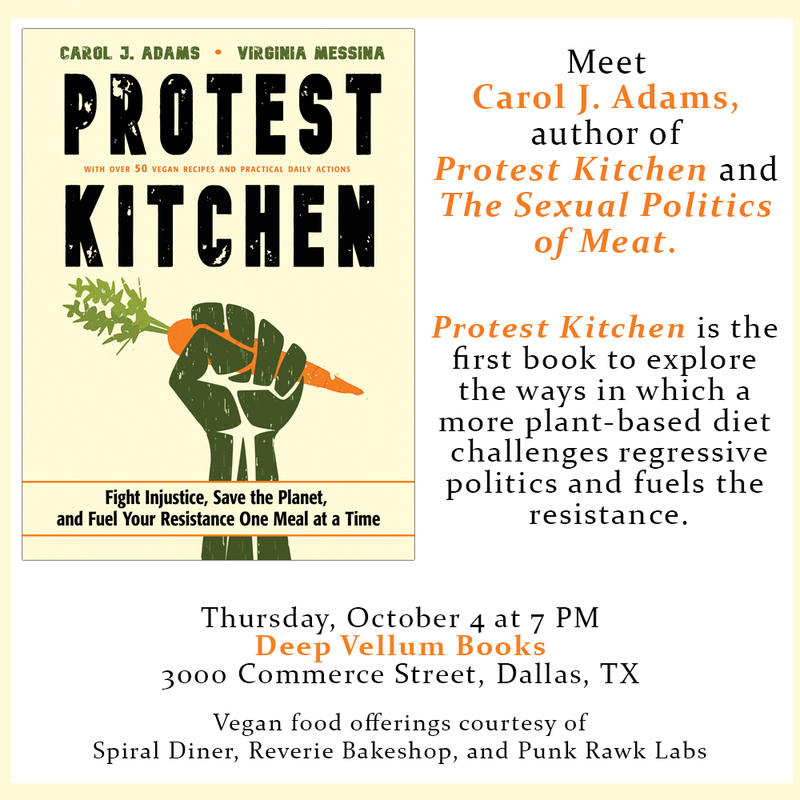 Come celebrate the publication of Protest Kitchen with me at Austin's venerable indie bookstore, Book People! Protest Kitchen Book Talk and Signing in Washington DC--where lots of protest is needed right now! 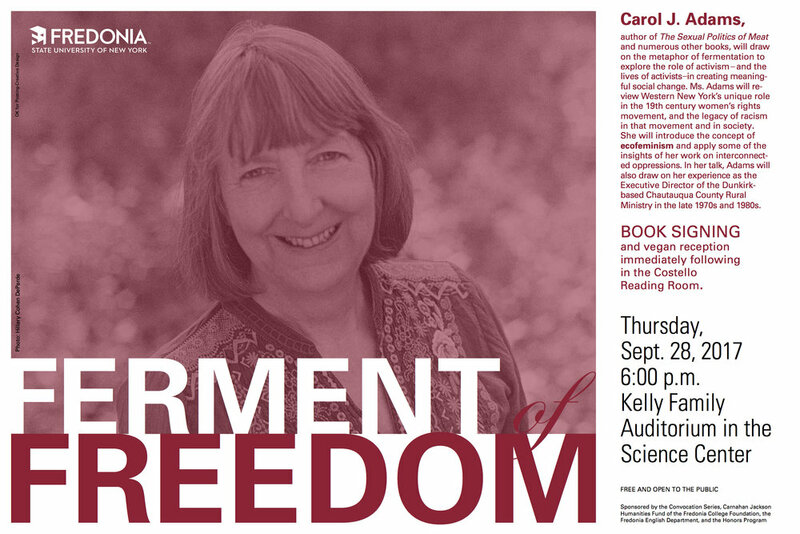 I’ll be joining Compassion Over Killing to discuss my new book Protest Kitchen, co-written with Virginia Messina. Protest Kitchen focuses on the food and lifestyle choices anyone can make for positive change in the face of the profound challenges of our time. This book shows how veganism provides a way to respond to a variety of issues that at first might not seem connected, including food justice, climate change, misogyny, national security, and racism. Delicious vegan snacks will be provided and COK will be giving away their popular loaded DC VegFest tote bags while supplies last. For more information see Compassion Over Killing’s event on Facebook. That’s right, I’ll be talking about #ProtestKitchen at the B’more Book Fair at Red Emma’s Radical Bookfair Pavilion.. A wonderful opportunity to speak truth to power about animals, social justice, veganism, misogyny, food justice, climate change, and compassion. The schedule for the Radical Bookfair Pavilion is here. See you at the harborfront! Map here. The Facebook event information is here. Join Marla Rose of Vegan Street and me as I discuss The Sexual Politics of Meat and my new books Burger and Protest Kitchen at this dream of an indie bookstore. Let us know you are coming at here. Animal philosophy and theory not only decenter the human; they also offer ways to question and challenge white privilege; to question masculine privilege and challenge patriarchy; and to question “American exceptionalism” and challenge xenophobia. It is important to understand the link between animal exploitation and other means of oppression—including Western definitions of the “human” as white and masculine, the role of Western colonialism in promoting meat and dairy, and the interaction between misogyny and the use of animals. 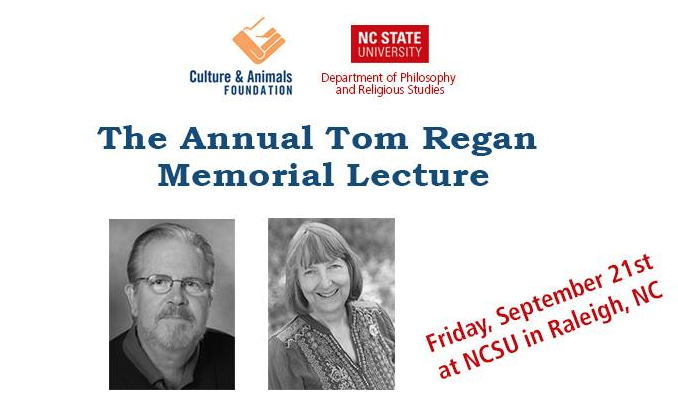 The lecture will highlight the insights that arise through a dialogue between engaged animal ethics and the critique of contemporary political attitudes and actions. I love this independent bookstore! Join me at Malaprops on September 19th, as I talk about my new books Burger and Protest Kitchen. Join Ginny Messina and myself as we launch Protest Kitchen at the great Washington DC VegFest. Protest Kitchen is an empowering presentation on the food and lifestyle choices anyone can make for positive change in the face of the profound challenges of our time. Our food choices not only affect personal health and the environment, but are also tied to issues of food justice, climate change, misogyny, national security, and racism, xenophobia, and bullying. Protest Kitchen is the first book to explore the ways in which a more plant-based diet challenges regressive politics and fuels the resistance. Drawing on the book of that title, the presentation combines social analysis of repressive values and how veganism is part of the resistance against them, with specific suggestions for change through “Daily Actions” and vegan recipes. It is empowering because it shows how veganism as a part of resistance provides a way to respond to a variety of issues that at first might not seem connected to veganism. It includes a discussion of including all animals within a compassionate framework, and the relationship between compassion and hospitality. For more information check out the Toronto Vegetarian Society's VegFest website. The burger, long the All-American meal, is undergoing an identity crisis. From its shifting place in popular culture to the efforts, by investors such as Bill Gates, to seek to find the non-animal burger that can feed the world, the burger’s identity has become as malleable as that patty of protein, itself, before it is thrown on a grill. Carol Adams’s Burger is a fast-paced and eclectic exploration of the history, business, cultural dynamics and gender politics of the ordinary hamburger. After defining the burger as a modernist solution to protein delivery whose time has passed–and explaining why that is–Adams delves into the history of the veggie burger and the emergence of plant-based meats, including burgers. For more information, see the Toronto Vegetarian Society's VegFest website. Based on a chapter from my forthcoming book with Virginia Messina, Protest Kitchen, I'll be discussing the connections among racism, sexism and attitudes toward animals at Southern Adventist University in Chattanooga. I'll be returning to my roots of Chautauqua County, New York to speak as part of Fredonia State's Convocation Series, to celebrate the 100th anniversary of women getting the vote in New York State. I'll discuss activism, and being agents of change, and what it means to look past the species barrier to the status of the other animals. The Sexual Politics of Meat Slide Show at Winnipeg's first VegFest! I'm thrilled to be returning to Toronto's awesome Veg Fest. I'll be signing copies of my new book, Even Vegans Die, co-written with Virginia Messina and Patti Breitman at Reverie Bakeshop, 1930 N. Coit Rd #140, Richardson, TX 75080. Stop by and get some delicious vegan food and talk with me about why we chose this subject. Hope to see you in June! Watch for The Sexual Politics of Meat Slide Show at this weekend event where we'll be talking about the important issues of food justice! 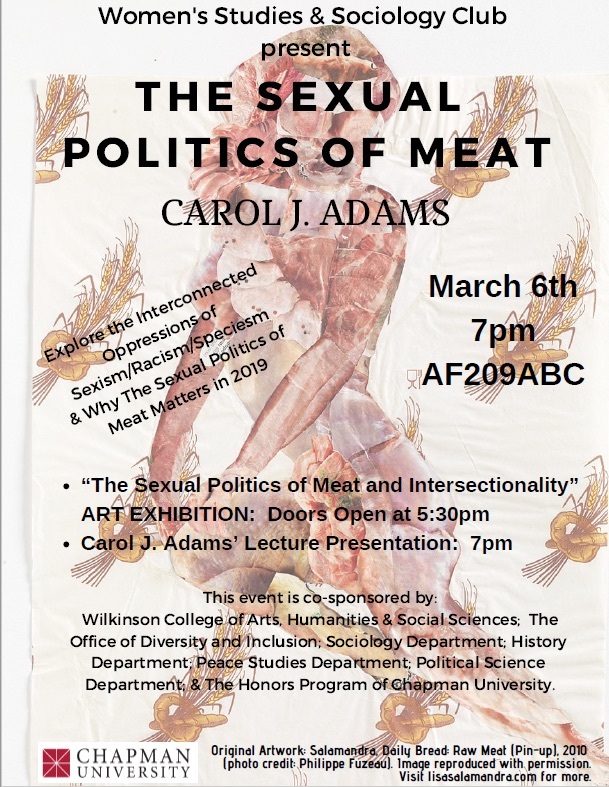 The Sexual Politics of Meat Slide Show is coming to Allegheny College!